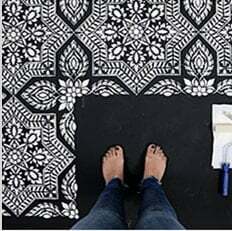 Mandala stencils are very popular in today's DIY decor. With our beautiful and intricate Empathy mandala stencil, you can make a stunning statement on any wall or floor. Let's increase empathy in our lives :) Our large mandala stencils can be stenciled in one or multiple paint colors to match your decor. Mandala stencils are easy and fast to use despite there seeming intricacy. Perfect choice for a first time stenciling project. This mandala is a "Filler design", meaning you'll be stenciling not the outlines, but the openings in between lines. Please refer to the Actual stencil image. Mandala stencils are really easy to use, virtually anyone can do it. No artistic ability required! Simply tape it to the wall or floor using BLUE painter's tape, then load your foam roller with the paint of your choice (latex or acrylic). Don't use too much paint! Get rid of excess paint by rolling the foam roller over a folded paper towel. Then, just roll it over the stencil applying light to medium pressure for an quick fabulous result! Don't press on the roller too hard otherwise you might get some paint seepage under the stencil.